With the Phoenix probe now on Mars digging and cooking away it seemed appropriate to write something on Martian meteorites this month. It has been decades since specimens of Mars were analyzed the way they are now by Phoenix. As meteorite collectors we have a debt to the Viking missions. I remember not so many years ago when there were only a handful of unattainable Martian meteorites. Today there are so many available that it is possible to just collect them and exclude other meteorites and end up with a wonderful collection. I have to admit that Martian and Lunar meteorites have not been an area of great interest for me in collecting. But, I have gotten a few as they presented themselves at the right price. There is one exception to this however, and that is my small Martian individual of NWA 2987. There was something very exciting about having a complete individual stone from Mars. The little tiny specks and flakes were never thrilling to me. But, I sought out an individual for my collection when they became available. It is pretty clear at this point that these individuals come in a variety of NWA numbers that are likely paired to each other as one fall. But, that is something to sort out in years to come. 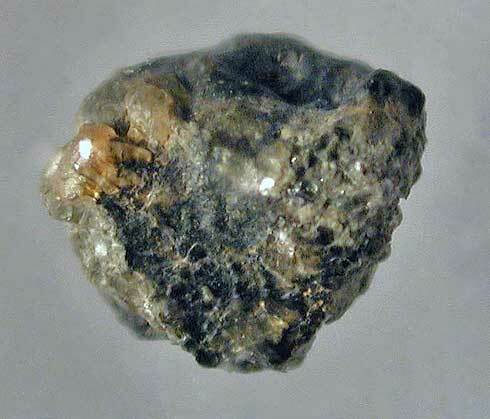 NWA 2987 is a Shergottite, found in 2005. My specimen has a substantial amount of fusion crust, but enough is missing to give me a good look inside. As a hunter of meteorites in the desert just beyond Los Angeles I was interested in getting a piece of one of the LA Martians. We had gotten to see them up close and personal at our tektite parties a couple times and they are beautiful meteorites. My slice of LA002 is pictured below. It is richly diverse in the kinds of clasts it shows and there is a prominent vein of glass running across it. It is also a Shergottite. In fact all the Martians in my collection are Shergottites. Zagami made a big stir when it hit the market years ago. I remember the prices and excitement. Everybody could finally get a piece of Mars. And it was a beautiful fresh meteorite with a great story. It had everything that a meteorite needs to be super desirable. And for a long while it was basically alone as the Martian that you could get for your collection. Most of us were never going to be able to get more than a few milligrams of Chassigny or Shergotty. Nakhla was available and could be gotten back then. I wonder why I never did. Now it is pretty expensive too. 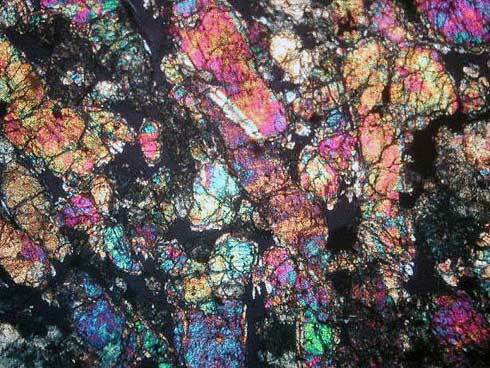 I have a couple nice fragments of Zagami and a thin section from which the picture below was taken. The intensive hunting of meteorites in the last few years has yielded a rich bounty of Martian material. It looks like it will still be many years before a return sample mission will be sent to our neighboring world. The meteorites from the red planet will remain for at least awhile longer the only source of hands-on material for research. As Phoenix digs into the surface it appears at the time of this writing that it has discovered water ice. This certainly was one of its major goals. We await the results of the oven heated samples to see what is contained in the soil precisely. But, as I read the information coming in from this exciting mission I gain further respect for the small samples of Mars in my collection. 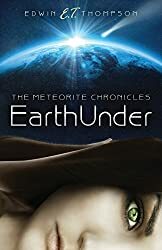 Blasted from the surface by huge impact energy they traveled as wanderers for ages in space only to be subjected at the end to a burning passage through the Earth’s atmosphere. Lying abandoned on the ground; in most cases some luck was involved in their recovery and recognition. If the Viking missions decades ago had failed and we did not know the composition of the Martian atmosphere would they have been recognized as Mars meteorites? Or would they still be classed with the other achondrites? 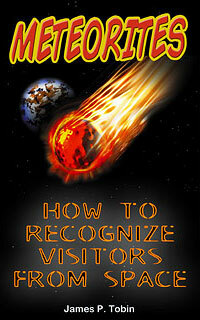 Someday we may know from returned samples where most of the meteorites originate. How will that alter our collections? Will meteorites that are old and weathered even be hunted once thousands of kilos of return samples have been brought back by manned missions? Once rock is mined in space by the thousands of tons will we hunt so diligently here on Earth for meteorites?. 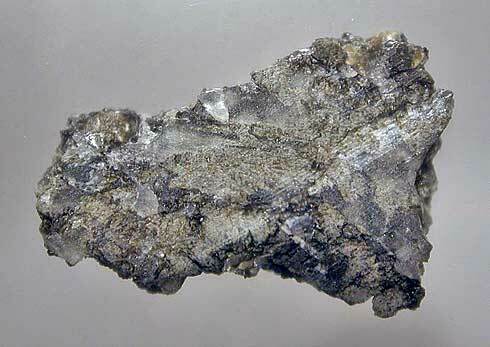 It may be that the historical circumstances of their recovery is what will someday determine the value of meteorites, and not the rarity they have today. At some point there may be vast amount of this material coming to Earth by non meteoric methods. I think if I am still around that I will continue to value my specimens. But, it may be harder to get new collectors to enter the hobby.